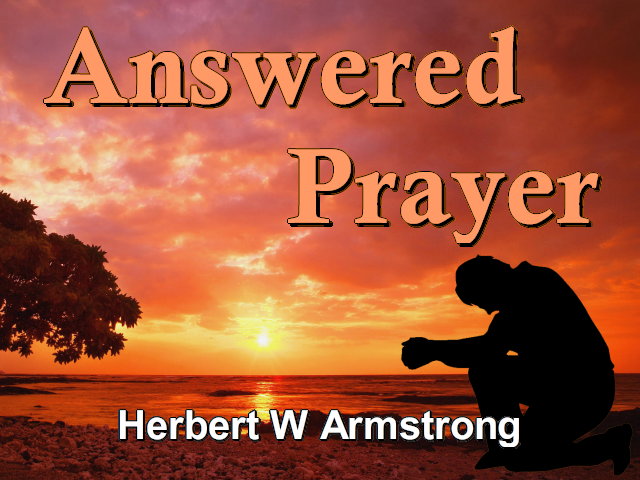 And greetings friends around the world, this is Herbert W Armstrong with the good news of the World Tomorrow! But in the world today I know that your life is beset with problems and troubles. Your mind harassed by fears and worries. There is only one way out of this and almost no one knows that way and is able to apply it. That way is answered prayer. But you probably lack the faith to be sure of receiving a direct answer to prayer. There is no greater tragedy on this earth today than the almost universal lack of faith. And this in turn is largely due to the lack of understanding of what faith is. We're living in frightful times today and if ever we needed the protection that comes from answered prayer my friends, it is now. Jesus Christ, the Son of God, the Founder of the Christian religion, looked down the stream of time and foresaw this almost total unbelief in our time and our generation just prior to His return to this earth to establish world peace. And of our twentieth century generation Jesus Christ said: "When the Son of man cometh [as He is coming, within this present generation, He said — or He asked — this question], shall he find faith on the earth" (Luke 18:8)? Shall He find faith on the earth? But is it any wonder that the world has lost sight of real faith? Is it any wonder that so many say; "my faith isn't very strong", or, "I just can't seem to work up the faith." People today do not know what faith is, or why they do not possess it or how they might receive it. And yet without faith my friends there is no salvation. When Jesus walked the earth in human flesh He possessed faith, and yet He said plainly, "of myself I can do nothing" (John 5:30 paraphrased). Now few realize what He did, the miracles He performed, He did not do by any supernatural power inherent within Himself, no power of His own. Everything that He did, every miracle that He performed was done literally through faith, setting us a beautiful example. Well, how then did He perform His miracles, accomplish His mighty works? Well, He said, "the Father that dwelleth in me, he doeth the works" (John 14:10). Yes, it was the power of God within Him, and even as you and I may be, Jesus was filled with God's power, God's Holy Spirit, God's dynamic supernatural power. This power of God Almighty, the Creator literally was in Jesus, just as that same identical power, of that same identical Living Creator God, may be within you today. Oh my friends, what are we missing today! All the apostles and evangelists of the first century true Church of God did perform miracles and even greater miracles than Jesus had performed, until actually when Peter's shadow passed over people the sick were healed. The sick and the afflicted were healed merely by the passing of Peter's shadow over them. Now Peter, Stephen, Phillip, Paul — all common humble ordinary men of themselves, disciples of Jesus Christ — all had that power my friends, the same identical power that Jesus had because they lived and they walked close to God and they were filled with the Holy Spirit of God, the power of God. And we seem to lack that power today, not because God denies us that power, but because we are so close to a modern materialistic world; our minds are so filled with material interests of this life, because we have strayed so far from God and because we are not in touch with God. God says draw nigh unto me and I will draw nigh unto you (James 4:8). But we don't draw near to God; we draw near to the materialistic interests and the pleasures and the pastimes of this world, and then because of a lack of enough of the right kind of surrendered, submissive, earnest and heart rending prayer. We have strayed from God. And consequently because we are not filled with the Holy Spirit we don't have the faith to get an answer to our prayers. So now let's just ask two questions and then answer them. First, just what is faith anyway? Most people just don't know what faith is. And secondly, how may we have it and how may it be increased? You know, very few people know that — how to get faith. You have to get it from without, and very few people know that or know how to get it. Now will you read the Bible definition of faith? Let's learn what faith is. Open your Bible to Hebrews, the eleventh chapter and the first verse. The eleventh chapter of Hebrews is known as the faith chapter of the Bible. It tells us what faith is. Now notice, it says here: "...faith is the substance [that is the assurance] of things hoped for...." (Hebrews 11:1). Now, you don't hope for something that you already have. So, my friends, faith you see comes before possession. Now once you have received the possession of a thing you no longer hope to have it. But even before you receive it, you have it in substance and that substance, that assurance, that you shall possess it that is faith. And then again, faith is an evidence, the evidence of that which is not seen. Because you read here (Hebrews 11:1) that faith is the substance and it's the evidence of things not seen. Faith precedes the actual receiving of that that you are asking for. And faith is the evidence that you shall have it, before you even see it or before you possess it. It is the evidence of things not yet seen. You don't have it yet, you don't see it, you don't feel it and yet faith is your evidence that you have or that you shall have whatever it is that you're hoping for, asking for. Faith is the substance, the assurance of receiving that which you still hope for. But it is an absolute assurance clear to the extent of knowing that you're going to have it. And so I want you to notice, that when you hope for things or ask God for things in prayer, that there is evidence, there is a proof because evidence is proof that you shall receive what you ask. And what is that proof, that evidence? Is it the actual receiving of the answer so that you can see it or feel it or hear it, possess it in some physical manner? Not at all my friends. Now suppose for instance that you're taken ill, you're taken with a disease. Well, is there anything that more people are suspicious of or antagonistic toward today, in this day of lack of faith than miraculous healing as an act of God? Well possibly this has come from the presence of some notorious quacks. But because there are quacks, and there are many in the medical profession do you doubt the medical physicians and surgeons? Do you decide that there's nothing to it because there are quacks? I don't think you do. Now Jesus healed the sick continually. And He said that the works which He did, and that meant healing because healing was one of them, we should do also. Now suppose that you asked God to heal you. Naturally you want some evidence that you are going to be healed. You want to know you're going to be healed because according to your faith be it unto you and if you don't have the faith you will not be healed (Matthew 9:29). You'd certainly have to believe in it. So what is that evidence, or that proof? Is it the evidence of the pain ceasing, the swelling going down or something that you see or that you feel? You know, I knew a man once who said, "Whenever I can see anyone healed by direct prayer then I'll believe in it." Now this man said that he wanted to believe in healing. He wanted to have faith in it but he was looking for a material evidence that he could see, and that man died without ever having seen it. What we see, what we feel is not the true evidence. Having the thing, seeing it, is not faith. Faith precedes possession because faith is confidence, assurance, that you shall possess it. So, faith is a spiritual matter and it has nothing to do with the five senses which are physical. It has nothing to do with what you see or what you feel or what you hear or smell or taste. Faith is our evidence and it is spiritual. Alright, now let's picture a rather unusual trial in a courtroom. It's a very strange most unusual trial that I have in mind but I think perhaps it may illustrate the point and may help some of you. For the one being tried in this trial is none other than God Almighty Himself, the Creator. And you yourself are sitting as a one man judge and jury. The prosecuting attorney is human carnality and human reason. Now the attorney for the defense is the Holy Spirit of God. God is accused; God is accused by carnal human reason of lying, of unfaithfulness, of obtaining things more valuable than money under false pretenses. God is accused of willful nonpayment of promissory notes, because God has promised healing in the Bible. And He's accused of not keeping His word and not making that promise good. Now you, now sitting as judge and jury have read God's command and His written promise which is a promissory note, the same as a check on the bank or a promissory note. In the fifth chapter of James in the Bible, and the fourteenth verse, where you find a command for what you are to do and a promise of what God is to do for your physical healing when you are sick. It says there, "Is any sick among you? Let him call for the elders of the church; and let them pray over him, anointing him with oil in the name of the Lord. And the prayer of faith shall save the sick, and the Lord shall raise him up [that's a promissory note]; and if he have committed sins, they shall be forgiven..." (James 5:14,15). Now there is an absolute promise with God back of it if God inspired the writing of the Holy Bible. Alright, now suppose that you have followed God's instructions. You were sick, you've called the elders of the Church; they have prayed over you the prayer of faith, they've anointed you with oil. Now the prosecuting attorney, which is carnal human reason, just natural human reason of the natural mind that is naturally hostile toward God and suspicious of God anyway, attempting to convict God of obtaining your allegiance under false pretenses, of breaking His contract and of lying. This carnal human reason presents before you — as the judge — his evidence. "My evidence" says carnal human reason "is literal tangible evidence that is real, it's evidence you can really see, and you can feel. Why you can see for yourself that you are not healed. And you can feel it, that pain is still there. In fact, perhaps it's grown worse." "Now God gave you", he says, "a written promise, as certainly as anyone ever gave a promissory note. You conformed to all of God's conditions, you did pray, you called the elders of the Church and they prayed and you believed, yes, you did believe. But you can now see my evidence you can feel my evidence, you are still suffering, you are not healed. God did not heal you; God did not keep His word. I demand that you find God Almighty guilty of lying, of obtaining your allegiance under false pretenses, of not performing what He promised in His written word." Now, the attorney for the defense, God's Holy Spirit, speaks to you, quietly and calmly, and he says to you: "I now present my evidence that God's word is true, that God is faithful, that God cannot lie. My evidence is not anything that you can see or feel, my evidence is simple faith. Patient trust in the veracity of God's word. It is impossible for God to lie. My evidence is your faith. Your faith in this fact and in the promise of God, and faith is the evidence of that which is not seen and not felt. No, you don't see it, you don't see that you're healed; you don't feel that you're healed; you rather see and feel that you're not. But those are fleshly evidences and you mustn't look to those; you must look to the spiritual evidence of faith and of trust in God." Now God gave you His word that it is His will to heal you. He commanded you to call the elders of the Church, which you did. He promised unconditionally that He would heal you. But God has also made it a part of His contract in His word that according to your faith be it unto you, in the very words of Christ. Now faith is your evidence that God will do what He has promised. You can't see faith, you don't feel faith, what you see or feel has nothing to do with faith. But God did not promise how or when He would heal you, He merely said He'd do it. And faith relies on God until He does it. He hasn't done it yet. Do you still have faith? If you do you shall be healed. Now God's purpose in your life is to transform you from what you have been into the very image of His son, into the very character of God Himself. Part of this character is the learning of patience. And God instructs you in James, the first chapter and the third verse that the trying of your faith works patience into your character. Now God has revealed to you in this and other scriptures that He will sometimes delay healing you in order to try your faith to see if you still believe Him although He hasn't done it yet. And to teach you to be patient. Now your healing God has promised shall be according to your faith. Faith is trusting God to do that which He has not yet done. After the healing is completed, then you no longer need to exercise any faith, you won't need faith after you see that you're healed and feel that you're healed. The instant that you believe in these human doubts and the evidence of these human doubts — that is, what you feel and see — that very moment you make out God a liar, you lose faith in God and thereupon you break your part of the agreement, which is to have faith and to keep on having faith and trusting God and relying upon Him until He performs what He has promised. And therefore, I call upon you to have patience, to keep on trusting God until He heals you and then He will heal you, you can depend upon it. Well now, the evidence is all in, you've heard both lawyers for both sides, they've given their case, you will now render the verdict. You must render your verdict based upon the evidence. Now two kinds of evidence have been supplied. If you believe the spiritual evidence and if you reject the physical evidence of what you see and feel — all this pain and everything — you've pronounced sentence upon God's word, that it has been vindicated by your verdict; you shall be released of the disease and what God promised shall be carried out in God's own due time. But, if you decide that the physical evidence of what you see and feel, that you still feel that pain, you still see that sore or whatever it may be and that that's to be trusted over and above the word of Almighty God, and if you reject the word of God and the promise of God and you refuse to believe in it, you refuse in other words to accept and to trust in the evidence of faith, the very word of God until God completes it, and then you yourself render your verdict, 'not healed' — you render the verdict that God is guilty of lying and then you certainly will not be healed. If you're going to look back and say, "Well I expected God to do it just the minute I asked Him", and you've given God we'll say two seconds, or maybe two minutes, or two hours or two days or two weeks and God didn't do it within the time you set and you say God didn't do it, the verdict is 'not healed' and you won't be healed. My friends, whatever you need, the first thing to do to be sure of receiving an answer to your prayers is to search the scriptures to learn whether it is God's will. You find that the scriptures tell you what is God's will. Read Ephesians five verse seventeen. The Bible reveals God's will. We need never say, "Well, I know God could heal me if it's His will". My friends, you can know God's will and so far as healing is concerned I can tell you definitely that God's word, the Bible, says plainly and emphatically that it is, that it always is God's will to heal you. Your Bible is full of God's promises, literally full of them. If you need anything, study to see whether God has promised it, and if He has, God cannot break a promise. Why my friends should it be difficult to trust the Supreme One who created all, the Almighty God? Why should it be difficult to trust Him, who set in motion all forces and energy and sustains and controls every force and energy and power and all the actions in the entire universe? Yes, I ask you why should it be difficult to trust such a One as God. Now, I know whereof I speak because I've been putting these things I'm telling you to the test not once but literally hundreds and thousands of times. And God has never failed to keep His promises once. There's some things I've asked Him that I haven't received yet, but I know that I shall. I remember one thing that I asked God and I was five years receiving the answer. But the answer came in a most miraculous way and at a time when it saved two lives and if I'd had that answer sooner those lives would not have been saved. So God had a reason for delaying and trying my patience for five long years before He answered. Why, this very broadcast my friends is a direct answer to prayer. This entire work of God, including the World Tomorrow broadcast, the Plain Truth magazine, our Ambassador College, a work which has now grown to worldwide scope and influence, started as small as any work could start, literally from nothing. It has been from the very beginning one hundred percent a work of faith and we have had to really learn this lesson of faith before it ever really got started to going. And now very briefly, why don't people have faith and how may you get it and how may it be increased? "Well," so many say, "Well, I have no impression; I don't have any feeling, any conviction that I'm going to get the answer." They want to wait until they have a certain conviction or some kind of a feeling or some assurance they feel physically or in their minds, before they really believe that they're going to have the answer. But my friends that is not faith, that's only feeling and your feeling, your convictions, your impressions have absolutely not one thing or the other to do with faith. Faith has only to do with God's word, with God's promises. The one question is, has God promised to do it in your Bible? If He has, then probabilities, possibilities, feelings, convictions, impressions have absolutely nothing one way or the other to with it. God has a thousand ways that we know nothing of, of answering and of providing whatever He has promised. We don't need to know how He's going to do it or when. And, that's another thing; He almost never does it the way that we expect. So don't try to figure out how it's possible for God to do whatever you ask. You are trusting in a supernatural God — a miracle working God — then believe in that power of God. God works in mysterious ways His wonders to perform . What He has promised He will perform, but He'll do it His way and His time. Leave all that to God and just trust Him, rely on His word. And now finally, faith is the gift of God. So many think that everything else that comes from God is a gift but the faith required to receive all of these things is something that we ourselves must somehow work up, or strain for, or strive for. But we just have to relax and trust God even for the very faith that we receive by which we receive everything else. Now in Revelation 14:12 is a description of the True Church of this day. And those in that Church have the faith of Jesus. The faith of Jesus. I want you to notice, it's the faith of Jesus not just faith in Him. You find in Galatians 2:16 that first we have to believe in Christ, then we receive as His gift the faith of Christ, that's the very faith Christ did have and does have, placed within us. How can you get it? Draw closer to God, get to know God, surrender all the way to Him and do His will and then pray. You get to know Him in prayer. We're too close to material things. Through prayer, much prayer, you can come closer to God and the spiritual things, and what a happy joyous experience it is once you have really achieved that condition. And now, just before I leave the air, my friends, if you would like this message on faith in print — to study and absorb until you can really receive and exercise the faith to free your mind from all these undue anxious concerns, fears and worries, for deliverance from every trouble. Even healing — any of the members of your family when you're sick — well, just write for the free booklet "What is Faith" and a booklet on Healing. There is no charge...write for the booklet on faith and the booklet on healing. We will be glad to mail it to you, there is no charge it is absolutely free. So until next time, this is Herbert W Armstrong saying, "Goodbye friends."